Taking a break from frustration with the IJN Ryujo build, I'll be switching gears for a bit with a return to one of my favorite model companies, Pyro! This one will be the Life-Like Hobby Kits reissue of Pyro’s U.S.S. Constellation model from 1966. The U.S.S. Constellation is a sloop-of-war, the last sail-only warship built for the United States Navy. Commissioned in 1855, she served for close to a century before finally being retired in 1954. During her long career Constellation performed a wide variety of duties including trade protection, Civil War blockade duty, cargo transport, and as a training ship. She brought humanitarian relief for the 1879 Irish famine, and even served as the reserve flagship for the then-Commander in Chief of the Atlantic Fleet, Admiral Ernest J. King, in 1941. Perhaps Constellation’s most significant contribution was early in her career with the slave trade patrol, during which she captured three slave ships and freed a total of 705 slaves. 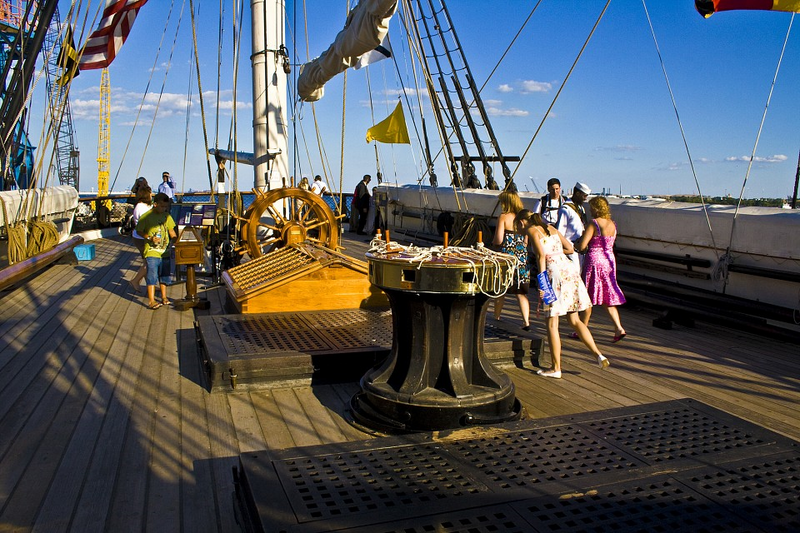 She is now preserved as a museum ship in Baltimore, Maryland. I happened to pick up a rather battered copy of the kit on the cheap a while back, but the real appeal of this model is as a reminder of a trip to Washington, D.C. and Baltimore a few years ago with my dad (that’s him in the foreground). We made the trip without the wives or kids, so we were able to do all the “boring” guy activities – USS Constellation, National Museum of the U.S. Navy at the Washington Navy Yard, USCG Taney, USS Torsk, the Chesapeake light ship, junk food dinners every night – without fear of trying the patience of loved ones. It was great! Looking forward to following along. I expect to learn something new, as always. 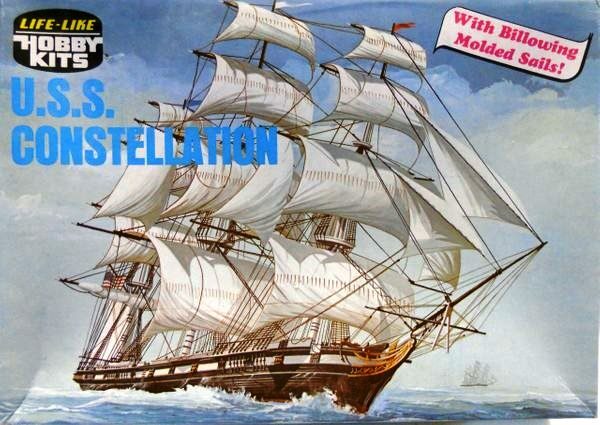 What is really interesting is that Constellation was built new from the keel up by the Navy evidently telling Congress that they were only refitting the Constellation of the Barbary Wars and the War of 1812. I don't know the full story of how they pulled that bit of a white lie off, someone probably does, but evidently it would be neither the first or last time they did it. Anyone interested in this early period of the U S Navy's history should find a copy of Ian Toll's "Six Frigates" and read it without delay. I will be watching this one, notebook in hand. Always wanted to do a sailing ship, preferably one of the early frigates, but somehow never got around to it. PS: You and your dad ought to have tried Phillips' Crab House while at the Inner Harbor. 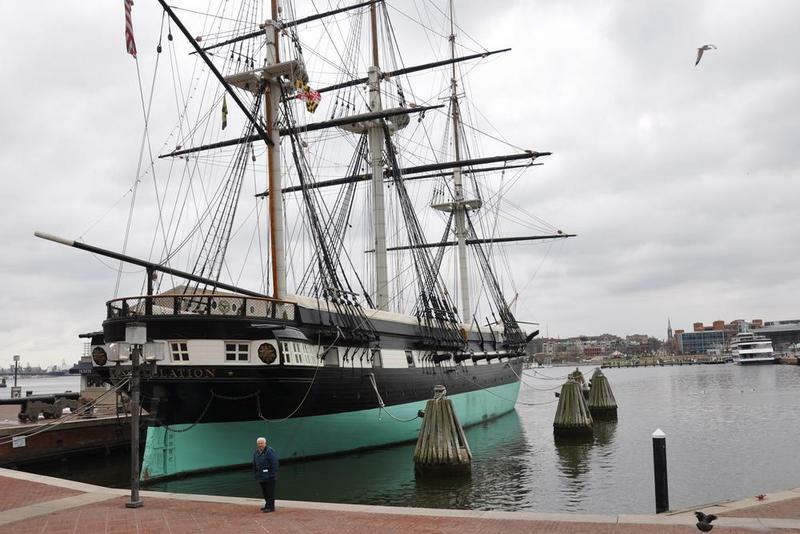 The Torsk and Pride of Baltimore are also moored there, both worth seeing. "Black Budget" 19th Century style! Having stood on her decks many times Tim, I can tell you she is a fine ship, and her record of service speaks for itself. Let's get this rascal under full sail, and let her remind us of a day long gone but not forgotten. Agreed, Chuck, she is a fine ship! Dating from 1972, Life-Like’s reissue of Pyro’s 1966 U.S.S. Constellation kit isn’t exactly new, and over the years the box has had its share of bumps too - but the parts look as pristine as the day they were manufactured! In the spirit of Pyro’s simplified, quick-build model kits, I don’t plan to go crazy superdetailing this one. Maybe add some details, correct a few shortcomings… but mostly I just want to have fun with the build. One change was to add some lead weights to the inside of the hull for a bit of heft to make it more stable on its display cradle. The fifty year old molds are not today’s state of the art, but the parts fit reasonably well with the help of a little filler. I managed to snap off and lose the starboard bower anchor catshead while assembling the hull, but a length of .030 X .030 inch strip made for a quick repair. Pyro’s uncomplicated four-piece hull assembles quickly and easily. Si, John, Chuck, Russ, and Bob - thank you all for your kind words. This is going to be a fairly straightforward build, but I'll try to keep it interesting! Pyro depicted the capstan on the spar deck as a simplified pedestal onto which a separate capstan head, with its removable bars in place, was to be fitted. The representation was pretty basic, so I substituted a capstan raided from a 1/350 Zvezda Varyag kit. I didn’t add the removable bars to the new part, though. Their deployment didn’t make sense to me as the hatch covers are not in place – the men turning the capstan would have fallen into the ship! Tim - just spotted this one. I'll be following along and looking forward to seeing the finished kit! Thanks Robert. This build should be a fairly quick one! The ports on the hull are molded as open with the gun muzzles visible. 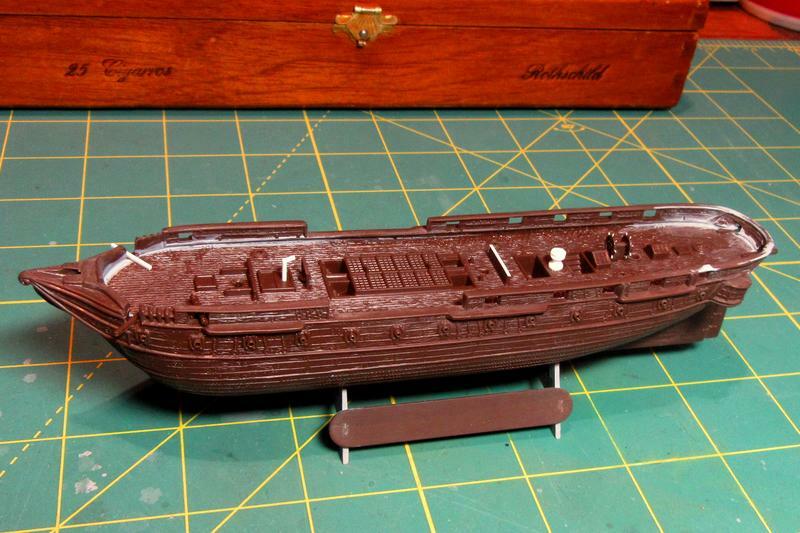 Cutting open the kit gunports, fabricating a gundeck inside and fitting cannon would have been a sizeable task – well beyond the scope of what I want to do with this simple kit. I contented myself with drilling out the cannon muzzles. Also, although the Zvezda Varyag capstan was definitely an improvement over the original kit representation, it too was replaced with one from a Revell U.S.S. Olympia kit that I liked even better. I nicked the adjacent fife rail while cutting away the capstan base molded to the deck; the white plastic strip there is a repair. Your build is really interesting. I don't believe I seen such a small size sailing ship before. Looking forward to how you manage it. The capstan looks so much better than the kit part, it does amuse me that in most kits of this era the capstan bars are moulded in place. Drilling out the cannons on the gundeck has really brought the hull to life. As I re-read that a silly question came to mind.... what did they do with the hatch covers when they weren't over the hatches? Can't see them just laying them off to the side on deck.... Just idle curiosity. ...what did they do with the hatch covers when they weren't over the hatches? Can't see them just laying them off to the side on deck.... Just idle curiosity. I don't know, but as the covers were sectional I imagine they were taken apart and struck below in pieces when the hatches were opened up. Assuming that USN ships of the time were run along similar lines to RN, then the hatches would only have been uncovered during loading and unloading. The covers would have been on all the time otherwise. When open the covers were just moved to the sides. Another one of your extremely cool Pyro builds!! Somehow I stopped believing you when you say 'this is going to be a quick and straight forward one', you'll start detailing it on the way I'm ready to bet! Anyway, very nice and a promising start, I'm definitely in for the ride!! Thanks Jan - I really am trying to keep this build fast with only simple improvements and fixing only those details I just can't live with! One of those quick upgrades was a replacement for the uninspiring kit galley stovepipe made from plastic rod. The kit’s helm parts, on the other hand, were well designed, but it was the 1960s-era plastic injection technology that let them down; both parts were “short shot” with most of the grab handles on the wheel perimeters incompletely molded. After cleaning up the wheels, tiny lengths Plastruct .010 inch styrene rod replaced the poorly molded handles. The rebuilt wheels should look good under a coat of paint. With these and the other little fixes completed, it is on to the deck cannon! Tim your ability to turn the ordinary into the extraordinary continues to astound! Tim your ability to turn the ordinary in the extraordinary continues to astound! Thanks, guys, but in all honesty my efforts are just minor fixes to make a good model a little better. These old Pyro kits are actually underappreciated gems! It is the minor fixes that turn a good model into a great model! Thanks, Si. In addition to those simplified cannon muzzles molded into the hull sides, the kit also comes with twelve separately molded weapons for the topside weather deck. Although the U.S.S. Constellation museum ship no longer has these cannon on deck, I opted to include them on the model anyway because the kit parts are so nicely done. Unfortunately the tiny parts, though well mastered, suffer from severe mold misalignment which meant the cleanup process destroyed some of the detail. They still look pretty nice, though. I upgraded them slightly by drilling out the muzzles and adding the knobs at the back ends of the barrels using .018 inch discs cut from .010 inch plastic. Test fitted in place, they add a pleasing busyness to the deck. Not a ship modeler myself, but I always love your pyro builds, Tim. Following with interest.